Price Changes due to costs rising at the printers. All books ordered after 1/6/2007 will be at the higher cost. We apologise for the rise. This book presents evidence which supports the tales by fishermen etc that a population of living Plesiosaurs- marine reptiles from the Age of Dinosaurs and known by the Aborigines as the 'Mirreulla', inhabits the Hawkesbury River in Sydney’s north? This evidence is backed up by Ancient Aboriginal traditions and rock art, and European eyewitness accounts dating from early settlement times to the present. The mysterious long-necked ‘Mirreeula’ known to the Aboriginal people for untold thousands of years, is a Cryptozoological enigma to rival Scotland’s Loch Ness Monsters and other Plesiosaur-type creatures seen worldwide. Read about the many tales by fishermen of frightening night-time encounters with long-necked fearsome-looking reptilian giants, mystery disappearances as well as other eerie encounters with living Plesiosaurs in the waters of this River of Monsters! 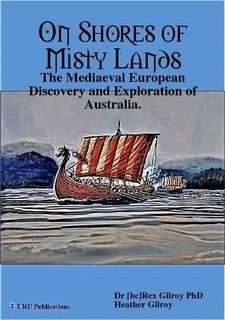 In this ground-breaking book the Gilroys here reveal a forgotten history of mediaeval European maritime contacts with Australia. Learn of hitherto unknown accounts of British and mainland European Celtic mariners who found and settled Australia centuries before the Dark Ages, or the advent of the first Dutch explorers and Captain James Cook of the 17th & 18th centuries. This book contains a wealth of photographic evidence, demonstrating 12th century landfalls of Scottish, Irish, Welsh mineral and gemstone-seeking colonists, and the megalithic stoneworks, settlement ruins, and thousands of stone inscriptions these ancient colonists left behind them, which speak of the daily lives of the settlers. Read of the mediaeval European belief that the mysterious southern continent was the fabled “Land of the Holy Grail” and the accounts of Welsh Knights, Knights Templars, and other adventurers who sailed here in search of it. 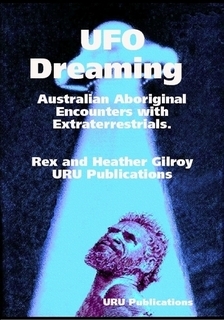 UFO Dreaming – Australian Aboriginal Encounters with Extraterrestrials. Were ancient Aborigines contacted by advanced beings from the Cosmos? 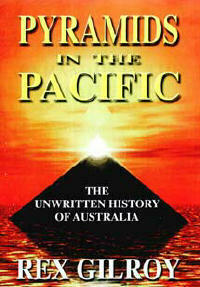 This book reveals evidence of ancient ET colonisation of Aboriginal Australia in the dim past. It also reveals present-day encounters with Unidentified Flying Objects. 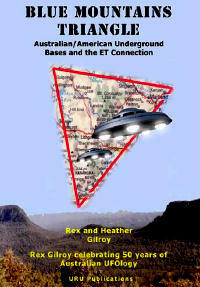 Read about UFO sightings, of vehicles followed by flying saucers, and close encounters between ETs and Aboriginal people. ET Abductions of Aborigines in country areas, as well as abductions of Aboriginal people to other worlds in space. Underground colonies and spaceports of Extra-Terrestrials in Australia. Ancient ET nuclear war fought in Australia, recorded in rock art by ancient tribesmen. This book is unique, for it deals exclusively with Australian Aboriginal UFO experiences, from ‘Flying Saucer’ encounters to abductions to other worlds beyond our own. 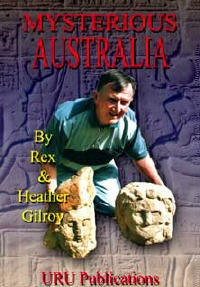 Authors Rex & Heather Gilroy offer the reader an entirely new field of research – Australian Aboriginal Ufology. Dr Gilroy and wife/fellow researcher Heather present startling evidence gathered by them Australia-wide, challenging conservative palaeological dogma that every last Dinosaur species became extinct 65 million years ago. Read about living sauropods and other living dinosaurs from mainland to island south-east Asia and Australia. The tyrannosaurid, sauropod and flying reptiles of New Guinea. The fearsome Burrunjor of Australia’s north and attacks by flesh-eating chicken-size ‘terror reptiles’ from Arnhem Land, the Gulf Country and Cape York Peninsula. The exciting search for footprints of ‘impossible’ reptilian giants in valley depths. The mystery of the ‘Lata’ sauropods - join the Gilroys and their field assistants in the search for these mysterious reptiles in ‘Dinosaur Swamplands’ deep within the Blue Mountains wilderness! 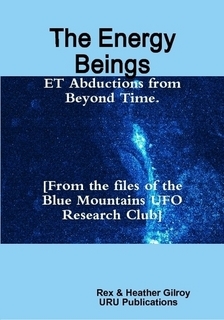 The ENERGY BEINGS -ET Abductions from Beyond Time. 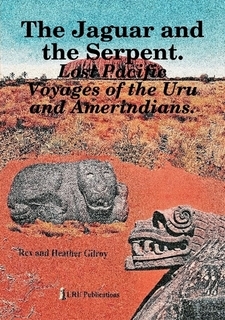 Written by Rex and Heather Gilroy one of Australia’s leading husband and wife research teams this is one of the most sensational books ever written on the Australian UFO mystery. 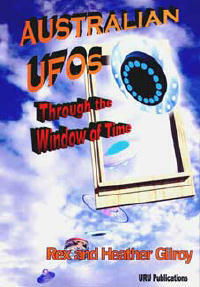 In this book the Gilroys go beyond much traditional UFOlogy to break new ground. Read of - Incredible ET medical operations to cure terminally ill people. ET ‘spirit collectors’ and their re-animation of the dead. The on-going mystery of the gigantic Burragorang Valley underground American-Australian top secret joint government advanced space travel technology base deep in the Blue Mountains. UFO Abductees accounts of visits to other worlds beyond our own. Encounters with ET beings composed of pure energy. Encounters with ETs inhabiting an unseen parallel time dimension to our own. The message is – We are not alone and are being observed by extra-terrestrial intelligences living unseen amid us on one or more parallel dimensions in Time and Space! 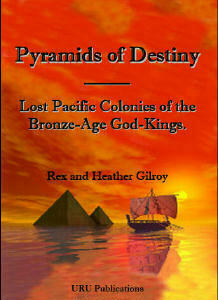 Not since Pyramids of Destiny – Lost Pacific Colonies of the Bronze-Age God-Kings [URU Publications 2009] have the authors, Rex and Heather Gilroy produced a book of such scope as that before the reader. See the massive cliffside and other stone heads of a lost Australian-American-Pacific history now revealed, backed up with over 1,000 photos which introduce elements of their megalithic culture to the pre-cultured Amerindians of North, Central and South America; but also the voyages of the later Amerindian cultures in search of the homeland of the Uru, the “Lost Paradise of Mankind”, and the great red rock, Uluru, that marked its centre. “Burrunjor!The Search For Australia's Living Tyrannosaurus”. 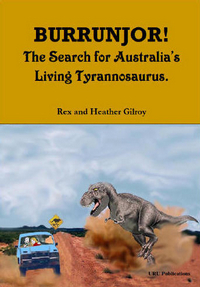 Heather and Rex Gilroy are pleased to announce their next book “Burrunjor-The Search For Australia's Living Tyrannosaurus”. Our book comes at a time when, thanks to our pioneering research into this mystery of Aboriginal Australia, Burrunjor is grabbing the attention of Cryptozoologists worldwide. During March this year the Gilroys, together with Greg our research assistant, carried out an expedition which resulted in the discovery of fresh tracks of Theropod dinosaur type, ancient rock carvings depicting these Tyrannosaurid monsters, and searched regions including the ‘Red Centre’ where these nightmarish monsters have been claimed seen for generations. Our book comes at a time when, thanks to our pioneering research into this mystery of Aboriginal Australia, Burrunjor is grabbing the attention of Cryptozoologists worldwide. It is all there in our new book for all to see, the sightings and terrifying close encounters, not only by Aborigines but also a great many European settlers; the stock ‘kills’ , the ‘Time-Window’ theory evidence; accounts of people who have witnessed the ‘impossible; people who have by chance entered ‘Time-Windows’ to encounter the “Age of Dinosaurs”. 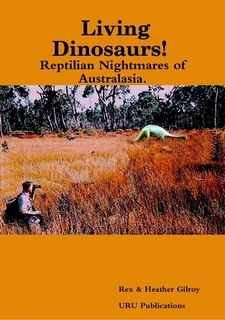 The book does not only feature information from Australia’s far north, for reports of Burrunjor come from South Australia, western Queensland, far western New South Wales and then there are also the eastern Australian encounters, particularly concerning the mysterious ‘Dinosaur swamplands’ of the Wollemi wilderness. BURRUNJOR! The Search for Australia’s Living Tyrannosaurus, is certain to create a sensation. 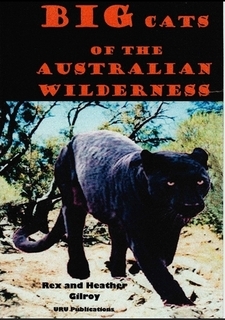 BIG CATS OF THE AUSTRALIAN WILDERNESS Here, written by Rex Gilroy the ‘the ‘father’ of Australian Cryptozoology and his wife and fellow researcher, Heather is the most important scientifically-based book ever written on the ‘Australian Panther’ mystery. The result of ten years preparation, this book goes beyond the usual sightings reports to examine the anatomy and physiology presenting evidence proving these ‘panthers’. Learn about - • The 19th century ‘Big Cat’ encounters of our pioneer settlers. • Mysterious giant marsupial carnivores such as the terrifying ‘Blue Mountains Lion’, the lion-like killer ‘cats’ of the New England Ranges of New South Wales and the ‘Black Terror Cats’ of the Queensland bush, the Cougar giants of Western Australia and more, much more. Covering a cross-section of Australian Cryptozoological and relict hominid, UFO and ancient Astronaut mysteries, evidence of ‘lost civilisations’ and pre-Aboriginal Stone-Age races. Traces evidence of ancient Egyptian, Phoenician, Celtic, Chinese, Spanish, Portuguese and other pre-Captain Cook discoverers and colonisers of Australia. 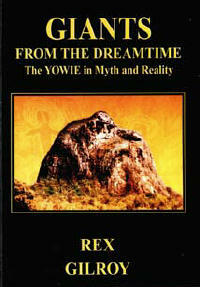 Here is a scientific investigation of Australia’s very own ‘Bigfoot’, crammed with information and hundreds of sightings reports, written by Rex Gilroy, Australia’s first and foremost ‘Yowie Man”, celebrating 50 years of Australian Yowie [relict hominid] research. Leading Australian UFOlogists Rex and Heather Gilroy present a book filled with hundreds of UFO sightings, close encounters, ET abduction cases, ‘ancient astronaut’ evidence, and experiences of people who have stepped through ‘time windows’. Evidence that Australia was the true location of the ‘lost paradise’ traditions of antiquity which gave rise to the ‘Atlantis’ of Plato. The results of 45 years research by Rex Gilroy, contains 600 photos. In this, the most important book ever written on Australian Cryptozoology, by the Gilroys Australia’s foremost researchers of the ‘Unexplained’ and our first and foremost ‘Yowie Man’, present over 3,000 eyewitness reports and other evidence, backed up by over 780 photographs, on an astounding array of mysterious and enigmatic creatures in what can best be described as the ‘Bible’ of Australian Cryptozoology. 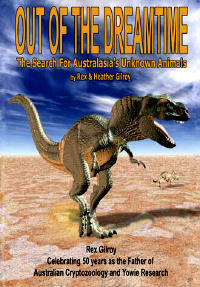 Never before has there been a book like this on Australia’s ‘unknown’ and incredible animals. Here is the culmination of 50 years of dedicated scientific field research by Rex Gilroy, put together by one of the world’s foremost husband and wife research teams! Rex Gilroy celebrates his 50 years of Australian UFO research. 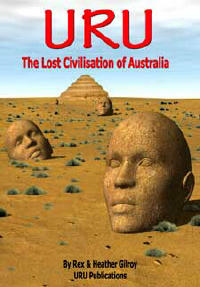 Together with his wife and fellow researcher, Heather, he has with this book [the result of 40 years research], uncovered THE AUSTRALIAN UFO CONSPIRACY OF THE CENTURY and one of the deadliest, best kept secrets of the Australian and American Governments and Military – an incredibly massive underground space travel technology research facility deep beneath the Blue Mountains west of Sydney NSW. This is a landmark book in the history of Australian UFOlogical research, produced by a husband and wife team, who believe the Australian public have a right to know what the authorities are doing behind their backs, and the mammoth CONSPIRACY which lies deep beneath the surface of the BLUE MOUNTAINS TRIANGLE! 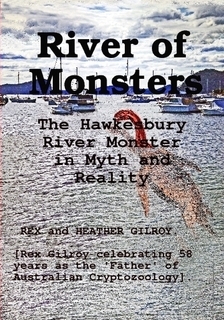 This book celebrates Rex Gilroy’s 50th anniversary as the Father of Australian Yowie [ie relict hominology] and Australian Cryptozoology research. In the coming months the Gilroys will release other books on the Yowie, and also an already completed book on Australia ‘big cats’, and other Cryptozoological titles are also forthcoming. 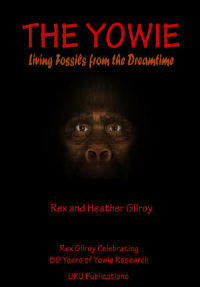 However, “The YOWIE – Living fossils from the Dreamtime” is a significant milestone in Australian relict hominology, for it is primarily concerned with the “fossil foundation” of the Yowie mystery. [plus p&h $A10 in Australia, or overseas prices on application.